Spent the day lazing around the house, especially for me. Had a super long afternoon nap.. to catch up on all my lack of sleep on weekdays. But we managed to get out of the house in the evening to Bishan Junction 8 for some window shopping. We also stopped by YaKun for some drinks/desserts. We decided to give Mama an advanced birthday treat. 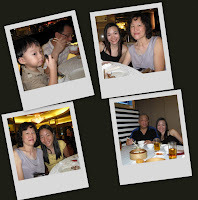 We sprang a surpise Dim Sum buffet at Excelsior Hotel (River City Restaurant). Her initial moody morning was immediately erased and her joy was indescribable. Of course, we know the one who really put her into a good mood was none other than her 'bao bei'. Hahaha..
==> Mama's happy look... heh heh. After eating out yesterday, we decided to eat at home today. Daddy prepared a hearty breakfast (forgot to take pics of it). Initially Baby G wanted to eat the muffins but when he saw my sunny-side up egg, he decided he preferred the egg & sausages instead. ==> Baby G enjoying his breakfast. After the delicious meal..... it's time for our car wash..... this time Baby G helped a lot. He managed to wipe the car down pretty well, he did the tyres, the doors & the bumper. He even admonished me for not doing a good job when he spotted some parts that were still dripping wet. What a bossy boy!